Family, faith, forgiveness . . . and love. 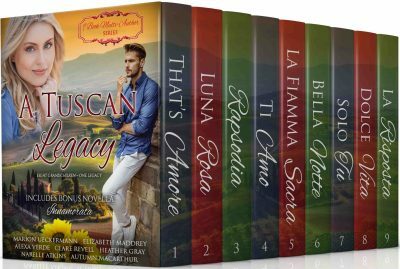 Enjoy a summer journey to Italy with A Tuscan Legacy! A risk-taking photographer with a crushed spirit and a control-addicted pizzeria chain owner with a crushed heart . . . What will it take for them to trust in God and love again? Don't miss this inspirational Christian romance series, brought together for the first time in this collection, PLUS a never-before-published tenth novella written especially for the set! Each book is a complete and satisfying romance, filled with faith, family, forgiveness, and love. 1300 pages of sweet summer reading from seven well-loved authors.